You don’t need me to tell you that hounds have big hearts, emotionally speaking, of course. But did you know that, anatomically, their hearts are also large relative to their body size? And that hounds, like other members of the canine species, may develop many types of heart disorders that we humans experience? AND, that many of the medications used to treat heart disorders in hounds are identical to the ones prescribed for humans? In keeping with the Affairs of the Heart motif, let’s discuss our dog’s most vital organ of all: the heart. After briefly reviewing how the hound’s heart functions, we’ll talk about some of the commonly diagnosed heart ailments, focusing on signs and symptoms, diagnosis, and treatment of canine heart disease. Perhaps the most important point you should take away from this article, however, is this: The veterinarian is the person who should evaluate your hound’s heath and determine if your dog shows evidence of heart disease. The information presented here is just that: “For Your Information.” You should immediately tell your vet about any changes in your hound’s condition that might represent a heart disorder. Your hound’s heart lies in the chest between and underneath the lungs. The average weight of the heart is 1% of its total body weight. A 75-lb (40kg) hound’s heart is approximately 40 grams. This relatively large heart derives partly from genetics and partly from the hound’s athletic training. The heart has four chambers: the upper chambers (LEFT/RIGHT ATRIA) and lower, or pumping chambers (LEFT/RIGHT VENTRICLES). Four valves control the blood flow through each chamber. First, the blood flows through the right side of the heart to the lungs. Heart – Inside View. 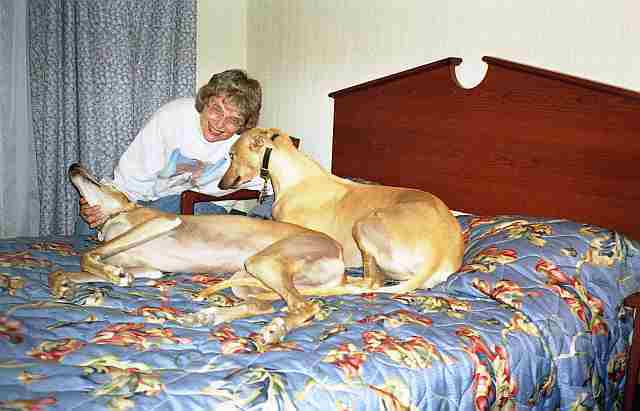 Remember that greyhound hearts are bigger than other breeds of dogs. Here, the blood receives the oxygen that will flow to all of the cells of the body. After leaving the lungs, blood goes into the left atrium. The blood is then pumped through the MITRAL VALVE into the strongest muscle of the heart: the left ventricle. This oxygen-enriched blood is then pumped into the aorta, the main artery in your hound’s circulatory system. The aorta then distributes the oxygenated blood throughout the body via the arterial system. One important point: properly functioning heart valves are “one-way streets;” blood should flow in a forward direction only. Some disease states occur when valves are unable to perform this function properly, resulting in improper blood distribution throughout the heart. 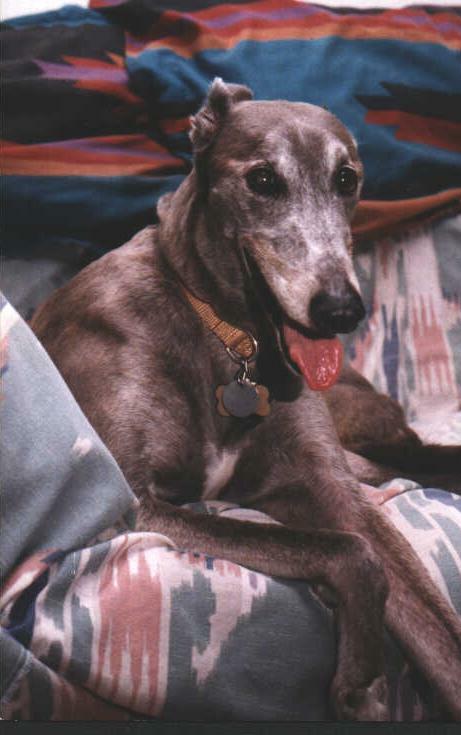 Your hound’s heart rate depends on several variables, such as: age, weight, fitness level, stress level, and illness. The normal heart rate range for a physically fit canine is sixty to eighty beats per minute. Ideally, your dog’s heart rate and respiration will return to normal range within ten minutes after ending strenuous exercise. One way to obtain your hound’s heart rate is by listening to its heart with a stethoscope. Another way is to feel for the pulse on the inside hind-leg just below and behind the knee joint. While, under most circumstances, you won’t be checking your hound’s blood pressure, normal values for a dog are 100-160 systolic (represents the pressure in the arteries as the heart is pumping), and 60-100 diastolic (represents the pressure in the arteries when they are relaxed). Congestive heart failure (CHF) is the heart’s inability to pump enough blood (and thus oxygen) throughout the body. CHF may occur due to dysfunction of the muscles or the valves of the heart, or from disturbances of the electrical conduction system which activate the heart muscles to contract. Signs of CHF vary depending upon the severity of disease. Early CHF may not give any clinical signs at all. As CHF progresses and the heart’s ability to pump effectively is diminished, the dog may manifest mild exercise intolerance, fatigue, or cough associated with exertion. Some signs which your vet may identify on physical exam include an enlarged heart (cardiomegaly); a heart murmur (a “whooshing” sound resulting from blood movement through a narrowed or incompetent valve); an extra “gallop” sound heard with the heartbeat; or an abnormal heartbeat itself (arrhythmia) on electrocardiogram. Severe CHF may result in lethargy, marked exercise intolerance, and edema from an accumulation of fluid in the tissues. Cardiac cachexia (severe weight/muscle mass loss), rapid heart and respiratory rate, and fluid in the lungs (pulmonary edema) may also occur. A dog experiencing severe CHF may also have a blue or dusky tinge to its gums because of lack of oxygen going to the tissues. Diagnosis of CHF consists of a careful physical examination of the hound, with special attention paid to listening to heart and lung sounds. The veterinarian may perform a chest radiograph and/or an electrocardiogram. The vet may also order bloodwork or an echocardiogram (ultrasound of the heart); the latter allows the vet to assess the movement of the heart muscles and valves, as well as to check for the presence of fluid or inflammation in the space surrounding the heart. Treatment of CHF is multifold: (1) identify and correct, if possible, underlying causes of CHF; (2) modify exercise according to the dog’s tolerance, (3) schedule regular follow-up examinations, bloodwork, and tests such as echocardiography, chest radiographs and/or electrocardiograms, and (4) give medication. Digitalis increases the pumping strength of the heart muscle and prevents the heart from beating too rapidly, thus decreasing the workload of the heart. Diuretics decrease fluid retention caused by the ineffective pumping mechanism associated with CHF. They are usually used in combination with an ACE-inhibitor and/or digitalis. Beta Blockers decrease the heart rate, the pressure in the arteries and the amount of oxygen the heart needs perform its functions, allowing the heart to pump more effectively with reduced workload. An example is Propranolol (Inderal). Calcium Channel Blockers reduce arterial constriction, thus lessening the workload of the heart. Examples are Diltiazem, Procardia. Myocarditis is an inflammation of heart muscle, sometimes accompanied by necrosis (tissue death) or scar tissue formation. The inflammatory changes that occur are usually most severe in the left ventricle of the heart — the major pumping chamber. Myocarditis may result from both infectious and noninfectious injuries to the heart. It is associated with viruses (Parvovirus, herpesvirus, Distemper), bacteria, fungal infection, spirochete infestation (Lyme disease), and Richettsia (Ehrlichiosis, Rocky Mt. Spotted Fever, Bartonella), and even parasitic infection (such as toxoplasmosis). Myocarditis generally appears as a sudden onset of CHF or an arrhythmia, with a recent history of infection. Other possibilities are a result of toxicity of a particular medication or from direct trauma to the heart, such as blunt trauma to the chest. Dogs with these histories are particularly subject to arrhythmias. When a hound initially shows symptoms of CHF, diagnostic tests will be performed, such as a physical examination, chest radiograph, echocardiogram, electrocardiogram, and bloodwork. The bloodwork will be of particular importance in defining an infectious cause of myocarditis, such as tickborne disease. In cases that are resistant to treatment, a biopsy of the lining of the heart may be the only way of providing a definitive diagnosis; this procedure is, however, not done routinely. Treatment of myocarditis consists of identifying and treating the infectious cause, if any. CHF caused by the myocarditis must also be treated by medication to prevent dysfunction and arrhythmias. The outcome of dogs with myocarditis is variable. Steroids have not proven to be of any benefit, especially since infection is a common precursor to myocarditis. A heart murmur is an additional sound heard at some point in the cycle of the dog’s normal heartbeat. This sound may range from a soft, “whooshing” sound to a harsh, “machine-like” sound. A murmur represents abnormal flow of blood through one of the heart valves. This may be caused by narrowing of the valve (stenosis) or by incompetency — the inability of the valve to fully close and to prevent backward flow of blood into another chamber (regurgitation or insufficiency). One of the most common murmurs heard is a Mitral Regurgitation murmur. Most veterinarians will be able to diagnose a heart murmur by listening to the hound’s heart with a stethoscope. Dogs who present with concurrent symptoms of mild CHF may require additional diagnostic tests, such as a chest radiograph or echocardiogram, to diagnose the cause and severity of a murmur. The majority of murmurs require no treatment, unless the hound also shows signs of CHF or other heart dysfunction such as arrhythmias. Common treatments include a salt-restricted diet, ACE inhibitors, diuretics, and/or digitalis. Dilated Cardiomyopathy (DCM) is an enlargement of the heart associated with thickening and decreased contractility (pumping ability) of heart muscle. Many things cause DCM. The inability of the heart to contract effectively may eventually result in CHF and/or arrhythmias such as atrial fibrillation, a rapid, disorganized type of contraction of the upper chambers of the heart. DCM is diagnosed by examination, chest radiographs and echocardiography. Treatment consists of control of arrhythmias and CHF. No discussion of canine heart disease is complete without mentioning heartworm. Dirofilaria immitis is transmitted by mosquitoes, and is almost always preventable by use of heartworm prophyllaxis such as Heartguard, Filaribits, or Interceptor. Once an infected mosquito bites the dog, the roundworm larvae travel into the tissues. The larvae then mature and enter the pulmonary arteries which bring blood from the heart to the lungs. Adult heartworms may reach a length of anywhere from four to twelve inches and begin producing microfilarae eighty-five to one hundred twenty days after the time of the initial infection. Clinical signs of heartworm infestation may resemble CHF: chronic cough, weakness, edema, and kidney or liver failure. All dogs must be tested for the presence of microfilaria before being started on heartworm prophyllaxis. The most common test is an ELISA immunoassay blood sample. There is some debate as to whether your hound should remain on heartworm prophyllaxis year-round. The frequency of ELISA testing for dogs kept on year-round treatment is also under debate. Discuss with your veterinarian the best protocol for your dog; this will vary depending upon your location, whether heartworm is endemic to your region, as well as the most recent veterinary research. Treatment for heartworm consists of two medications. Sodium Thiacetarsamide (Caparsolate) is administered intravenously over two days and requires hospitalization. This drug has the potential side effect of liver damage. The newer, more effective medication is Melarsomine Hydrochloride (Immiticide), which is more easily administered by intra-muscular injection. This can be administered in stages in order to lessen the risk of worm emboli (fragments of killed worms which may be shed after treatment). Administration of Immiticide consists of two injections twenty-four hours apart, then repeated in four months. There is no liver toxicity associated with this medication. After treatment, the dog must be observed for signs of worm emboli, which include fever, cough and blood in the sputum. The hound must also have its exercise restricted for a period of four weeks to reduce the risk of worm emboli. ELISA testing should also be performed approximately twelve weeks after treatment to confirm its efficacy. All-in-all, it is much to your dog’s benefit to prevent heartworm infestation. Be sure to check with your veterinarian to determine the proper medication and testing regimen for your hound. Author Jordan’s heart dog, Kody.